A workplace with health and safety programs in place, experience 20% - 40% reductions in worker injury and illness costs, according to OSHA research. In today’s super-competitive business climate, achieving gains of 20% - 40% through productivity – and even cost-cutting measures, represent a huge challenge for any company. Effective Safety Training Programs offer your organization an untapped reservoir of potential profitability. Effective Safety Training Programs give your organization a tool that can significantly control and reduce the loss of profits from work-related injury and illness. OXARC has a long history of providing safety training for our customers – across the range of industries and occupations. OXARC Safety Training can tailor a safety training package for your organization that will help you keep more of your hard-earned profits. Whether your employees need training on a single, specialized safety topic – or a complete annual package on core safety issues, call us for a no-obligation review of possible solutions. Training sessions and locations can be scheduled to meet your priorities. A new key to your organization’s Productivity, Performance & Profitability! We now offer on-site or off-site safety training by a qualified experienced safety professional. Our geographic area serves the Inland Northwestern, United States. - Additional topics are available. - Contact us today for information about site specific written programs, safety audits, and standard operating procedures. 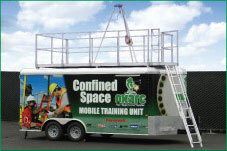 Safety & Compliance Training… OXARC Delivers!